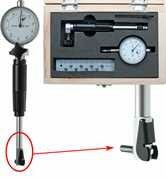 For accurate measurement of bore diameter, taper and ovality. The measurement is taken by 2 hardened steel anvils (1 fixed, 1 movable) which are automatically centred in the bore by a separate spring loaded guide. 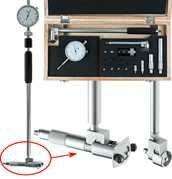 The movable anvil is connected to a push rod inside the body of the instrument which operates a dial gauge at the opposite end. 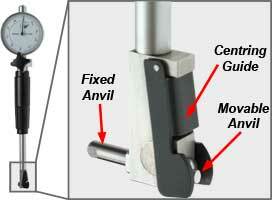 A set of different length anvils and in some cases, extension tubes, enable a wide range of bore diameters to be measured. 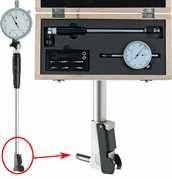 The instrument must be calibrated to a known dimension before use; e.g. 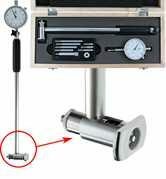 with an outside micrometer, setting ring etc.